Texas Marriage and Family Therapist, license No. 202684, since 12/04/2015. Texas Marriage and Family Therapy Supervisor, license No. 202684, since 08/2016. North Carolina Marriage and Family Therapist, license No. 1168, since 8/25/2006. North Carolina Licensed Professional Counselor, License No. 5387, since 3/26/2007. AAMFT Approved Supervisor, No. 103232, since 6/2010. My program of research focuses on early experience, and particularly how attachment relationships and their disruption, affects social and emotional development. In my earlier career efforts, I used animal models to explore these relationships, and expanded to include study of the neurobiological correlates. In particular, with my colleague Cort Pedersen, I have developed a model of intergenerational transmission of individual differences in maternal and other behaviors that is mediated through changes in the oxytocin system. This model describes how experiencing different levels of maternal behavior in early life leads to continuity in not only maternal behaviors, but also other phenomena, including depression-like behavior, in the animal models. Beginning in 2002, my research focus shifted to applying what I discovered in these animal models to human development. I began my career interested in studying communication processes in a species with a complex social organization. In graduate school, I joined a primate lab in order to pursue this goal. The primary thrust of my work was exploring social grooming as a form of tactile communication, and self-awareness/mirror self-recognition. I also worked in the area of ethics in research and conducted studies on enhancing the welfare of laboratory primates. This work in primatology in Melinda Novak’s lab set the stage for my move into biomedical models of the human condition. She had been Harry Harlow’s last PhD student, and the focus of her research was on the role of early relationships in social and emotional development, and the reversal of deficits produced by disruption of these relationships. My current research comprises two primary themes: the role of oxytocin in mediating the effects of early experience on adult behavior, and exploring the neurobiological structure of the oxytocin system by mapping oxytocin receptors in the brain. Beginning with behavioral assessment of the impact of attachment disruption on development and individual differences, this research project has moved from describing the phenomena to pursuing mechanisms. Since early relationship experiences have a wide range of effects in adulthood, this research program has explored not only maternal behavior consequences, but also stress, aggression, and sexual behavior, and has required attention to a number of methodological innovations. 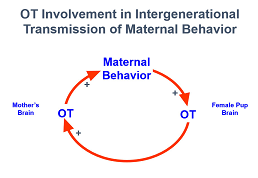 The model to the left identifies oxytocin (OT) as an important mediator of early experience for the intergenerational transmission of individual differences in maternal behavior. The significance of this relationship involves not only the issue of predicting individual differences in maternal behavior and attachment, but also understanding how early relationship trauma relates to the adult difficulties and pathologies we see in the human system. Bridging my work on attachment disruption to my research program here at Baylor, and as a natural outgrowth of my interest in applying my model to the human condition, I also study of the effects of early parental loss, operationalized as divorce, on later oxytocin levels and attachment styles. A new area I hope to explore in my study of attachment is the phenomenon of attachment to God. There is a body of research documenting the effects of faith on health. There is also a substantial amount of research documenting that perspectives on human attachment can contribute to explaining people’s relationships with God. I hope to explore attachment to God, and relate it to the effects of faith on health by examining oxytocin, which is implicated in stress responses that mediate the effects of faith on health. Most of the research on the oxytocin system has been conducted in animal models. I, therefore, became interested in exploring what was known about the neurobiological structure in humans, which was very little because the tools that worked in animals to visualize these receptors did not work in humans. I was able to develop a tool to study oxytocin receptors in human brain via immunohistochemistry. I, therefore, began a program of research to use this tool to study the distribution of oxytocin receptors in human brain. Initial studies have documented some similarities and differences with the animal literature. I anticipate that this line of research will explore mechanisms of these developmental changes through epigenetic processes such as methylation. To create healthy families, individuals require certain experiences in childhood that develop the capacity to function in healthy relationships. Understanding what types of early experience damage individual development, how such damage can be reversed, and what are the underlying mechanisms involved are necessary for successfully promoting healthy families.